Recently I visited Paris again – I first went long ago when I was in my twenties, then again in my thirties, once in my forties, and here I am into the fifties so it seemed almost predestined it was time to go again. Going somewhere new makes you learn so much about yourself and what you believe in as well as about the place you visit. This time, love was on my mind – not because I have a partner, but because I’ve spent a lot of time this year thinking about the essence of it – what is it really all about? Writing Chained Melody, and now with the first draft complete, has made me examine love from many angles I hadn’t given great thought to before and one experience from Paris brought the tricky question of love rearing up again. On a bridge called the Pont de l’Archeveche, near Notre Dame in Paris there are thousands of love locks –padlocks entwined and clasped to the bridge, bearing the names of the beloved and the lover. The trend derives from Serbia, where a local schoolmistress named Nada, who was from Vrnjačka Banja, fell in love with an army officer named Relja. After they committed to each other Relja went away to war in Greece where he fell in love with a local woman from Corfu. The result was that Relja and Nada broke off their engagement but Nada never recovered and was said to have died of a broken heart. Young girls from Vrnjacka Banja following the story decided to protect their own love by writing down their names, together with the names of their loved ones, on padlocks and attaching them to the railings of the bridge where Nada and Relja used to meet. The two names padlocked together signified their lover was locked to them, and therefore free to no-one else. It seems the world over, lovers wants to trap their lover by their side and keep them forever. Yet isn’t love meant to be quite the reverse of a trap? Is it not meant to set you free? Surely love is all about choice and that is why we find it so incomprehensible at times when we see two people who we objectively regard as quite unmatched, hopelessly, helplessly and happily in love? Love is patient, love is kind, and is not jealous; love does not brag and is not arrogant, does not act unbecomingly; it does not seek its own, is not provoked, does not take into account a wrong suffered, does not rejoice in unrighteousness, but rejoices with the truth; bears all things, believes all things, hopes all things, endures all things. Love never fails; but if there are gifts of prophecy, they will be done away; if there are tongues, they will cease; if there is knowledge, it will be done away. For we know in part, and we prophesy in part; but when the perfect comes, the partial will be done away. When I was a child, I used to speak as a child, think as a child, reason as a child; when I became a man, I did away with childish things. For now we see in a mirror dimly, but then face to face; now I know in part, but then I shall know fully just as I also have been fully known. But now abide faith, hope, love, these three; but the greatest of these is love. But how do we aspire to such demanding criteria? Perhaps the central element of the quote should warrant more attention than we generally give it because normally we focus on the first part of the quote, ‘love is patient’ etc, and the last, ‘but the greatest of these is love,’ to its detriment. Loving is all about being adult. To give and yet not expect a return is an adult concept; to face the truth of a situation and still accept, even if that truth is painful for us to bear – as in the case of rejection – is especially difficult, unless you approach it with unquestioning maturity and self-belief. Being rejected does not make you useless, or the rejecter cruel. It is simply a statement of differences. If you love someone, you allow them to choose. Actually, whether you love them or not, it is everyone’s right to choose, and not your right to impose. Finally where love ‘does not seek its own’, it never seeks to imprison the object of its attention because in doing that, we are not truly being loving. When you love truly, you can only want the best for that person, even if they choose differently from you, otherwise all you are seeking is your own satisfaction. 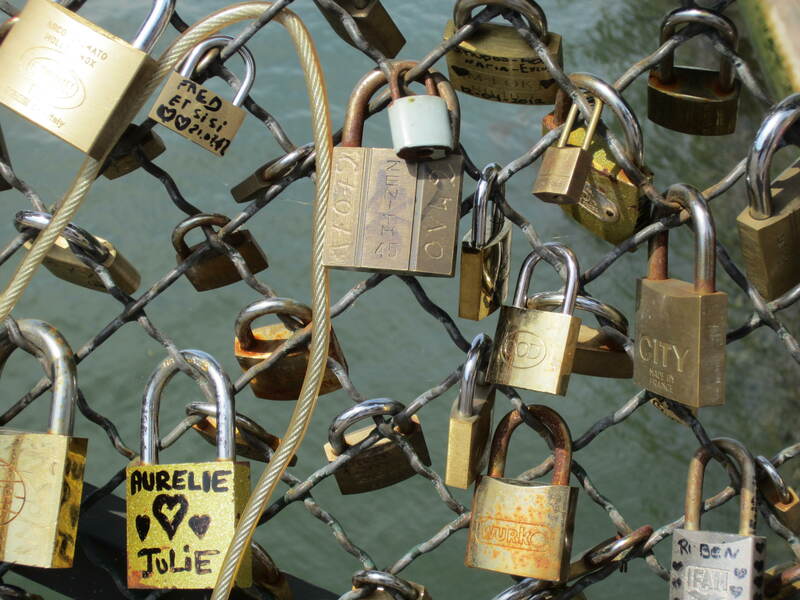 So are the padlocks of love appropriate, fascinating though they are? As a token offered and accepted at the time – maybe; but only if the key accompanies it. I have a love padlock in Chained Melody, but it is left open. I think that’s the way love should be. Always offered, but never expected. Future publication dates will be coming up shortly on my website as The Strategy is going onto Kindle as we speak, and Courting the Dark is with a publisher right now. Chained Melody is on track to be completed this month. where you’ll find lots more to read and information when my books are published. His, yours, theirs or Gods – picking a POV.